Such a sweet giveaway, Amy! In both thought and content :) Of course, I hope you know how much you are appreciated in return!!! I would love to be entered for a chance to win... I have been wanting to read this particular novel for a while. This sounds like a wonderful read! I really enjoy your blog and appreciate all that you put into it! awesome giveaway!!! I'm trying to get the Plaidy books. They're hard to find here in Canada. Thanks so much for the opportunity to win!!! This book looks like a great read!! I will definitely post this to twitter! What a nice and thoughtful way to start off the year, what a wonderful gesture! You are awesome. You have the best giveaways! Thank you! Ooo, I'd love to win this! I tweeted about it as @Sheltiemama, too. This would be my first Plaidy too. Thank you for including me in the giveaway. Aw, Amy, you're so sweet! I definitely have a goal of eventually reading all of Plaidy's books...she was such a machine, she has so many! This book sounds like an intesting read. You are so sweet! Thanks so much for such an awesome giveaway, and know that we love you, too! I would love to add this book to my growing Charles II collection! Jean Plaidy always gives us a book with excellent detail and interestingly written characters. Charles II is a most interesting historical figure. I have wanted to find out more about him for some time. For someone not raised in Britain, it is often difficult to keep the monarchs and their reigns straight. I'd love to read this book. I shared it on Facebook as Patricia Barraclough. I tweeted this giveaway at 2:08 AM Jan. 29 as pbbearclaw. So sweet of you!Thank you for the opportunity! Thank you for the wonderful giveaway. I have found so many great books from your reviews. Thanks for all of your time and effort that you put into your blog. It is a great resource about historical fiction. Everytime I visit, I always find more books to add to my wishlist! I would love to read this Plaidy. I have not read the Stuart saga yet. This looks great; my TBR pile is too large though, so I will not enter the giveaway, thanks! Thanks for the generous giveaway. I appreciate it! I would love to be entered! Thanks for the great giveaway! What a great giveaway! I haven't read this one but I love the author. Looks great, I'd love to enter! Why youa re so sweet my dear! Thanks so much for the chance to win. Following you is a pleasure - I find some of the greatest books here. What a great idea! This sounds like a great book as well so I would to win it :). Thank you for the giveaway! I enjoy your website a lot. I've not read this book but it looks great. Great giveaway! This book sounds great! I recently read a review of a book that was about Nell, and it sounded good also! Looks like an interesting read! THANKS for the giveaway. Amy, I love your site. Not only do I find great book recommendations, but your layout is lovely to look at. Thanks for sharing the giveaway. What a great choice for your giveaway. 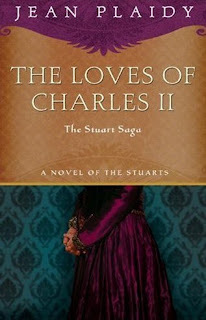 I've lots of novels in which Charles II plays a role, but never a book actually about HIM. Thanks for the opportunity. I've heard lots of good things about this author, but I've yet to read any of her work. Maybe this will be my first. I love your blog! We appreciate you! I would love to have a chance at this book Amy. Thanks! You always host the best givewaways, this book sounds very good. I would love to read this book. I love Jean Plaidy books!! I am so glad I found this website! It gives me so many ideas of books I want to read. I'd love to win a copy of a Jean Plaidy book. I've never read her. Thanks for such a great giveaway Amy! I'd definitely love to win this one. I love Jean's books and Victoria's, too! I haven't read too many Plaidy novels yet so I'd love a chance to win this one! What an intriguing time in history with lots of plots! I would so love to read this book and am crossing my fingers in hopes of being a winner. How sweet of you to share your proceeds with your followers...this is the best of the best for giveaways. I feel bad that I've never read Jean Plaidy before and I really need to get my act together and catch up with the rest of the historical reading world. I do love the tours that Jean has on her site and would love to do one of them someday...a girl can dream....right? I thought that I had already left a comment on this post but didn't see one so I'm leaving one now ;) I'm off to add it to my sidebar and spread some blog love. Thanks Amy! Hey I am a loyal follower! Pls enter me. Jean Plaidy is the first author of historical fiction that I read & she hooked me for life! Thanks for the giveaway! Sounds like a VERY interesting read. Count me in! Fantastic contest! Please enter me.